Working out how to travel long distances with your dog, is one of those things that you need to master as a dog owner. Whether you need to travel a longer distance as result of visiting family over Christmas or you just fancy heading that little bit further for your next holiday, the time will come that you end up reading articles like this. I know I did! Travelling longer distances has always been a normal occurrence for Millie and I. Her second journey in the car was a massive 9 hours from Carnoustie down to Essex after we’d picked her up from the breeder in Perth. Nothing quite like testing the waters early. Since then we’ve racked up hundreds of miles on our adventures. Well, she is an English Springer Spaniel and loves to explore! If you’re yet to go on your first journey with your new addition to the family or making your first long journey. Then firstly can I say congrats! I’m sure this will be the first of many adventures for you both. Grab that cuppa and I hope you enjoy! A long journey in the car requires much more planning than a short 2-minute drive to the beach. Whatever the reason for your journey, the first thing you will want to do is make sure you are prepared in the days before you set off. I promise you, this will make it pain-free for both you and your fur-kid. 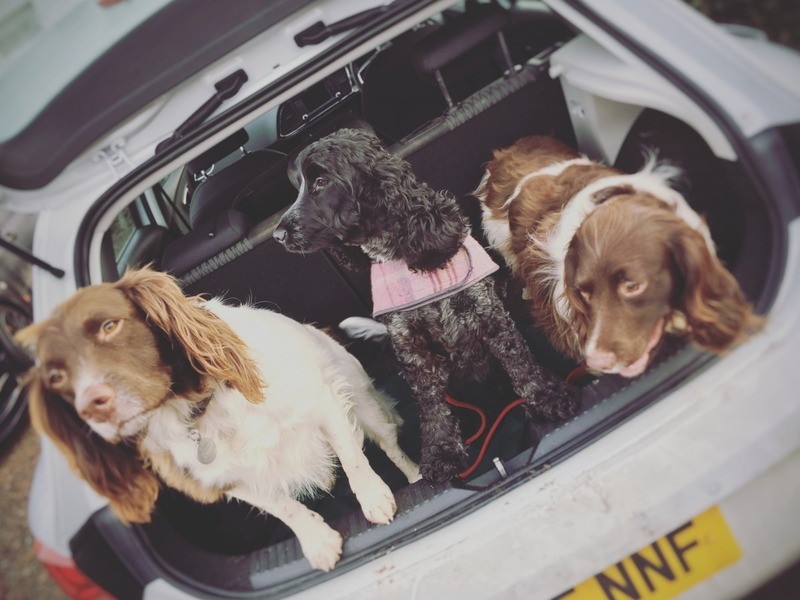 Deciding how you’ll transport your dog in the car, can be tricky and you’ll need to consider the number of passengers and luggage too. There are several options that are available to ensure everyone including yourself remains safe and comfortable too. A crate is generally viewed as the safest way to transport your dog while travelling. I previously used a foldable fabric crate which was secured into the back seats while Millie was a puppy. This meant she could be carried from the house to the car in situ and was closer to us during those early days which seemed to help with her anxiety. She was then moved into a larger crate in the car boot as she grew older. This was helpful to have when on holiday, as it could also be used when in self-catering accommodation too. If you are using a crate, do make sure it’s secured in the car regardless of its positioning. This will ensure both you and your dog is safe if you need to stop quickly or involved in an accident. I’ve found that you may be restricted both by the size of your dog and your car, as I now can’t fit the appropriate crate size for Millie into my boot space of back seat. I’ve found that using a crate may not be an option depending on the size of your dog and your car. I now can’t fit the appropriate crate size for Millie into my boot space or back seat meaning this is no longer an option without changing my car. I included an in-car seat belt in my previous blog on 7 Best Dog Travel Accessories and stand by how convenient and handy they can be! This clips into the car seat buckle and ensure that your dog is confined while travelling. However, they can travel in the back seat or front seat if space is appropriate. I’ve personally used this on shorter journeys when I’ve needed to use that boot space for other items. Remember these should be used with a harness and not a collar. This will prevent any injuries to your dog if you stop in an emergency. Also, great for when you are travelling with more than one dog! If you are restricted on boot space and want to protect your back seats, then this is a fab option. You can buy these in a variety of colours and in a waterproof version too. They also come with slots which allow you to use the in-car seat belts with them. Id’ thoroughly recommend as even with the top range variety there is space for a dog to move around and clamber underneath if they choose to do so. Millie always gave it her best try! Note that these can be used in boots of your car too and they are a handy first aid item to have in your car (for moving your dog if injured whilst out). While Millie never tries to climb over the seats from the boot of the car, I do have a dog guard in place, with a dog bed in the boot of the car, giving her plenty of space and comfort. I often travel with my parent’s dog Harley who likes to try and be closer to you but also it would just take one journey where Millie tried to do this, that would be unsafe for both of us. I also find that using a clip with harness doesn’t restrict their movement in the car. Just make sure you buy a longer version for space to use with the car boot anchor points. These are growing in popularity particularly for smaller dogs up to 5kg. They are effectively a smaller version of a hammock but attached to just one seat. There is a huge range of car seats for dogs now on the market. Numerous colours, safety levels and some are enclosed while others are open to allow the dog to view out. As with the other options, do make sure your dog isn’t able to escape the car seat during your journey. Don’t forget to pop a water bowl and large bottle of water into our car too whilst preparing for your journey. I tend to ensure I have some treats as a reward at stops and a spare lead and collar too, just in case I forget when leaving in a rush! If your puppy or dog isn’t used to travelling by car or they are a new addition to your family, then start small. After you’ve let your dog have a good sniff around your car and space with the engine off, then try to do several smaller journeys in advance. If you can help your dog associate going somewhere nice and rewarding with car travel this will help. This will also help gauge whether your dog is likely to suffer from travel sickness or some anxiety. If you find this is the case, then do consult your vet who will be able to help. It seems really obvious but before embarking upon any long journey, work out how you can increase the time your dog exercises for beforehand. This doesn’t always need to be immediately before depending on the time you plan to travel, you may want to consider doing this the day before. I pro-actively try to tire Millie out the day before any long journey. We do a longer walk out in the woods where I know she is more active or a Canicross session. I add in extra training and generally keep her on her toes having fun. A tired dog makes a huge difference when travelling and means we have a normal walk pre-embarking upon that days’ travel plans when we are already struggling for time. Just like leaving your dog at home alone, try to surround them with familiar smells and toys to help relieve boredom. As we have a bed always in the car, I tend to bring a blanket and two or three of Millie’s favourite toys. I tend to choose one softer toy plus a dog antler. Do be careful with bone or food treats that should be given only under supervision or may make your dog feel sick. If you’ve taken on board the point above re exercise, you’ll find they welcome the ‘rest day’ and snooze for most of the journey. 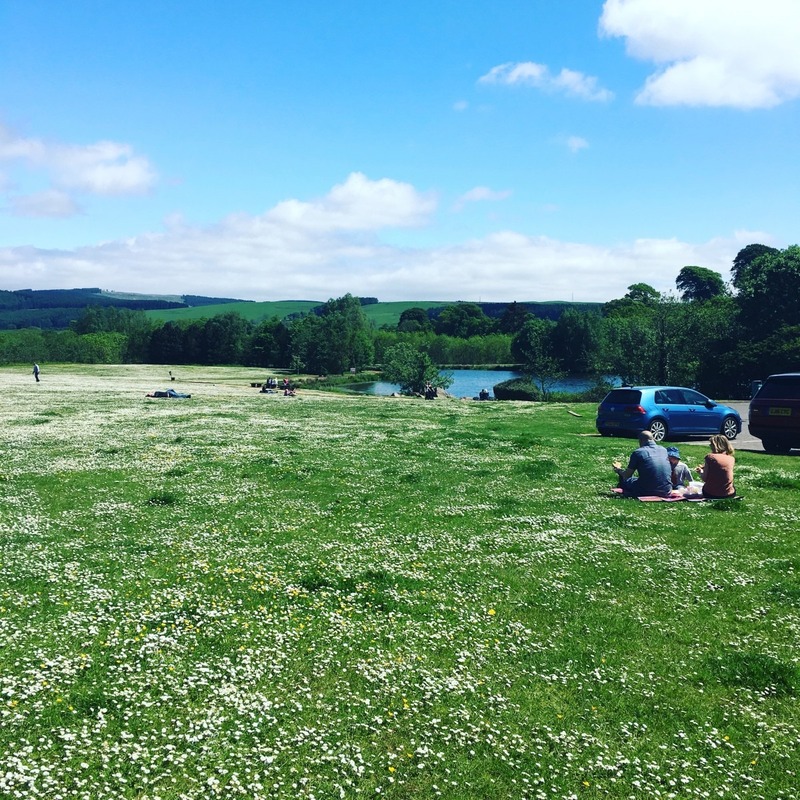 Over the years, I’ve spotted the best service stations that have larger areas where Millie can get off lead and more of a run around during a long journey. Traditionally these can be found in the larger service areas that include hotels. Have a good walk around the back or side of service stops and you’ll often find a slightly bigger green space tucked away. A fantastic site for finding walks is Driving with Dogs. You can search by region and motorway through this easy to use website. Sometimes you’ll spot there is a longer walk literally just a few mins away from a motorway. Perfect for those longer journeys and a welcome break from driving for you too. If you are setting off on a long journey, then it worth considering the times you are travelling, peak traffic times and the weather. I personally tend to try and be in the car about 5/6am so that I have a stop over the hottest parts of the day. I can take a much longer stop once about 4 hours in and walk out with Millie late morning and still not feel rushed to get to our destination. On an 8/9 hour journey, even with delays and stops, it means we can still arrive before 4 pm and give us time for a good walk at our destination. I’d always recommend rewarding your dog with a walk as soon as you arrive, even though you may not feel like it. Do remember that you’ll not be able to leave your dog in the car during hot weather for any length of time. If you are travelling solo, then this can be very difficult on a long journey unless you have one enormous bladder! My best tip is to ensure you have enough food and treats for yourself and make use of garages at service stops. I fill up the car, Millie is nicely in the shade under the garage forecourt cover and I can make use of the toilet facilities while paying. You could always grab an ice-cream at the same time! Win-win. While I’m sure you are looking forward to enjoying the destination with your best friend, the journey can be great fun too! Take a bit of time, prepare and enjoy it! 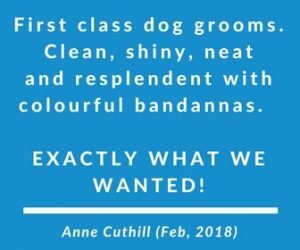 If you are looking for some inspiration for dog travel accessories then do check out my 7 Best Dog Travel Accessories Blog. But wherever you are off to on your travels, have a safe journey. There really is no better feeling than jumping into the car with your best friend for another adventure.